It's about the routing of an edge which I already tried to fix by telling where to locate the edge at the nodes as describe here: Strange edge placement in Graphviz Dot This worked but the Routing is the same strange Thing (should bi right instead of left through all content). "PowerUp" -> "Wait for \"Enter bootloader\" request"
"Acknowledge1" -> "isTarget (flash mode)"
"Acknowledge2" -> "isTarget (flash mode)"
"Pass command to slaves (2nd tier)" -> "awaitingSlaveBootloadTargetAcknowledge"
"Pass data (Hex records) to slave (2nd tier)" -> "hasDownloadTarget"
If the edge placement problem refers to the edge "Success2":e -> "idle":n going to the left rather than straight up, the reason is that dot wants to minimize edge crossings. Any other path would cause at least 1 crossing, so the current path is picked as having only 1 crossing. As for the 3 left bottom nodes, the dot algorithm wants to make the edges as short as possible, while trying to respect edge directions, so the "best" solution is to place them side by side. So dot is doing what it supposed to do given the constraints. One way to fix the second problem would be to add minlen=2 to the edge "isTarget (flash mode)" -> "Acknowledge2". However, I would recommend a different course, using fewer constraints. If your graph has a natural flow, that is the order in which the nodes and edges should be described. This should minimize the need to add constraint=false attributes. For example, you obviously want Success2 and Success1 at the bottom, so they should not be mentioned at the top of the graph. If you consider the "PowerUp" node as the root, the remaining edges and nodes should occur in DFS order. Also, if node A appears before node B, and they are on the same rank, it is likely that node A will be to the left of node B. For this reason, I would list "Wait for \"Enter bootloader\" request" -> "Start Firmware" before "Wait for \"Enter bootloader\" request" -> "Enter bootloader". Basically, just describe the graph in a natural top-down order, and avoid adding structural constraints unless it is really necessary to get what you want. Another suggestion concerns edge labels. Edge labels are treated at dummy nodes. This often works well, but sometimes this heavyweight approach can distort the layout, especially for long labels. I would consider changing some, or many, of the longer edge labels to xlabels. In this way, they are placed after the basic layout is done. Note that the rankdir attribute has no effect within a subgraph. It only affects the root graph. 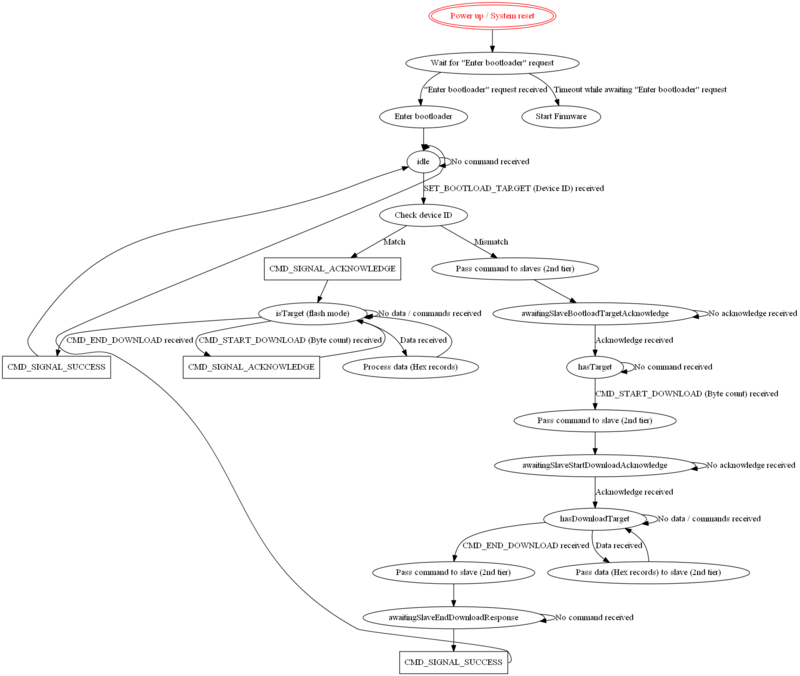 Anyway, here is how I would restructure your graph file giving the result result http://www.graphviz.org/Misc/forum/place.png. How to add edge labels in Graphviz? How to understand graphviz dot edge and node behavior?